A taxi driver who ran over and killed a woman fleeing her abductor has been found guilty of failing to stop and failing to report an accident. Mohammed Ashiq's taxi struck 20-year- old Stephanie Hammill as she "rolled or jumped" into its path from another car Dewsbury Magistrates were told. Ashiq, 53, from, Wakefield, had denied the charge claiming he did not realise he had struck a person. He said he though at first it was a bag or wind pressure blowing into his car. Miss Hammill, a travel agent, had been on a night out with her boyfriend James Garland and the pair were walking home when she got into a car she mistook for a taxi on 29 November 2003. She got into the back seat and left the door open for 22-year-old Mr Garland but it sped off, leaving him behind. Her body was found in the middle of the road a short distance away minutes later. The court heard Mr Ashiq had been driving back into Wakefield when he hit her body. Prosecutor Adrian Knox accepted the collision could not have been avoided. Experts said Miss Hammill had been dragged under his car for about 25 metres. The court was told Mr Ashiq had driven into Wakefield city centre and told a police officer he thought someone had thrown something at his car and damaged it. Following media reports about the accident he spoke to two friends about it. But the prosecution said he only went to police after replacing four of his car's tyres and cleaning the bumper and grille. 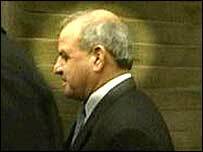 John Green, a police accident investigator, told the court flesh and blood had been found on the underside of the car. Mr Green said it was possible Mr Ashiq could have been unaware he had hit a person. After the verdict police said they were still trying to trace Miss Hammill's abductors. Det Insp Mark Ridley said: "We have previously made it clear that Mr Ashiq was not the main person we were interested in over the death of Stephanie Hammill. "He was charged in relation to the collision in which she died after escaping from another vehicle that had abducted her. "We are still making inquiries to trace her abductor. "That car, which we believe was in Wakefield on the night Stephanie died and may have been involved in her abduction, is currently undergoing a detailed forensic examination which is likely to last for a few weeks."